As part of our ongoing process to update and improve the PharmSaver experience, we are excited to announce we have added a few enhancements into the cart last night. 1 New button for "Exclude from Checkout". 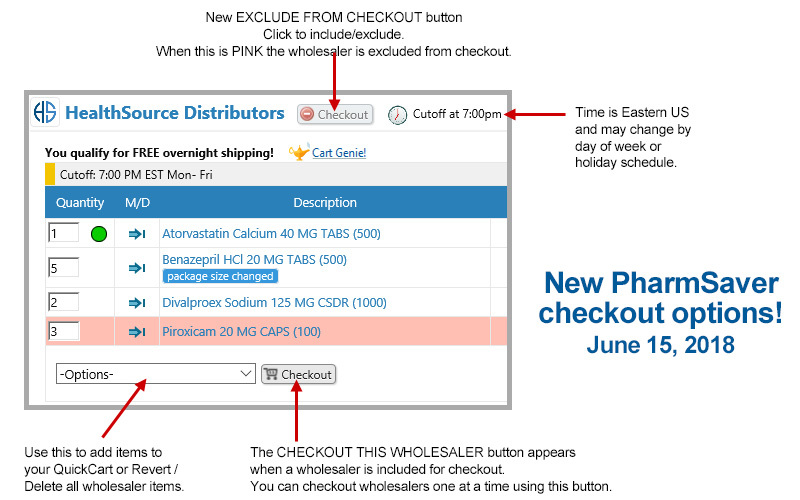 This appears near the wholesaler name and when clicked, it turns pink, indicating the wholesaler will not be included in a checkout. 2 New button for "Checkout this wholesaler". Appears near the "Options" drop down when the wholesaler is included for checkout. This replaces the Checkout option on the drop down list. 3 "Options" drop down now only lists QuickCart and delete/revert items. 4 Wholesaler Shipping Time is now based on day of the week and holiday schedule. We are able to designate days for all wholesalers or for individual wholesalers where items will not ship. Message appears saying items processed next business day. This can also be used to communicate weather events, e.g. snow/hurricane early cutoff. 5 Cart Optimization is available to pharmacies on request. This option optimizes the cart to leave all wholesalers in a state where they can be checked out. Wholesalers below shipping minimum will automatically have items disbursed to wholesalers that can checkout. 6 On Pharmacy Manager, Min Brand % now accepts negative values so that you can better manage your brand to generic ratio from your primary wholesaler. Now on PO Uploads brand drugs could be switched to a Pharmsaver wholesaler if they were slightly more in order to improve generic utilization.